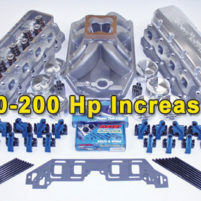 Categories: Buying Cylinder Heads - Tips and Info, Cylinder Heads, Cylinder Heads - Big Block Chevy, Cylinder Heads - Small Block Chevy. 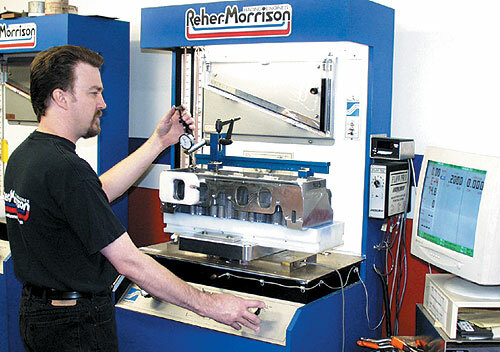 Factors in Cylinder Head Performance – At Reher Morrison we speak to many people daily. We help with their engine and parts purchase along with any technical assistance they may need. We thought we would help clear up some confusion with the difference between the 12º, 20º and 23º cylinder heads. For HP comparison, we will use our 583 Super Series Engine. If we use the same 583 engine and put on our 20º heads, we get 1150HP. However, the 20º head requires a lot of changes. Original belief is to bolt these heads on and you’ll gain 50-60HP. This is simply not true. 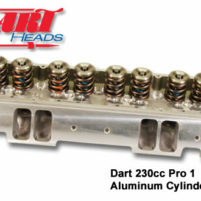 The 20º heads will require you to purchase specific parts. Example: Pistons, manifold, rockers, valve covers and pushrods. Though these heads maintain an outward appearance of conventional heads, they are not. Let’s use the 583 engine again. This time with our 12º Raptor cylinder heads. These heads will produce 1200HP. The 12º Raptor is the big chief style spread port head. As with the 20º heads, these too will require specific parts. Example: pistons, rockers, valve covers, manifold and pushrods. There is a myth of valve train problems with the big chief style heads. In our opinion, this is not the case with the 12º Raptor heads. With our custom rockers, you will not need offset lifters. 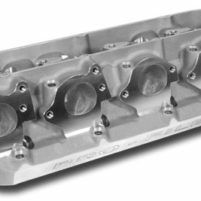 We feel this is the most powerful cylinder head available for our Super Series applications. We ask that you consider all of your options prior to making your purchase. Make sure you understand all that is involved. As there is not much you can buy that will give you a direct bolt-on horse power gain. Please do not hesitate to call us with any questions you may have. We look forward to hearing from you! Beware of CFM Numbers – CFM is one of the many factors that affect engine performance, but the big picture is far more complicated. Simple Flow bench airflow numbers should never be the first consideration in evaluating cylinder heads. The camshaft, heads, manifold and carburetor work together to feed the engine the air flow it demands. Everything must be matched perfectly or the entire system suffers greatly. The end result of a mis-match combination is decreased cylinder fill, power and acceleration. Matching the complex variables that go into a properly designed induction system is more involved than simple CFM numbers. CFM is a consideration but only one of many. The cylinder heads you buy must match the application and you’re racing objectives. Buy heads that match the engine you are racing now, not the one you are hoping to build in two years. A mismatched combination will be very disappointing! Bigger is not better! You’re always better off with Ports, Manifolds and Carburetors that are a little to small for the application. Smaller won’t destroy the acceleration and shift recovery of the engine and in the majority of cases it helps! Note! For more detailed explanations of these factors and tips, see Tech Talk #6, #16, and #70. 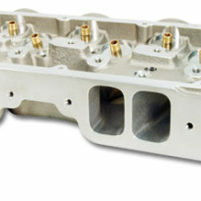 The information listed with each cylinder head is what each manufacturer has provided us with. The lists on our website do not include every head we sell. We work with Dart, Profiler, and Brodix. Call and take advantage of our experience and expertise. We are always happy to answer questions. We can find the right head for you.